Sharing a common engine and chassis platform, the new ‘Wing will be available as the base model GL1800 Gold Wing, and as a ‘Tour’ edition with top box, which will also offer a version equipped with DCT and air bag. Depending on the variant, up to 48kg has been saved compared to the previous model. The engine and chassis have been designed together, to move the riding position forward and create a much more compact motorcycle. The aluminium beam frame is constructed around the link front fork, which allows the engine to come further forward - as the front wheel moves up and down in a more vertical plane - while providing high-quality suspension control and front-end stability thanks to its stiffness and reduced friction. Suspension damping can also be adjusted electrically. And much thought went into the Gold Wing’s paint finish. The upper bodywork features deeper tone colour, with thick clear-coat complemented by seats finished in high-quality, high-grain materials. The lower body is highlighted with vivid textures that make a strong visual statement. GL1800 Gold Wing – Matte Majestic Silver. The previous Gold Wing featured an expansive design and attitude. 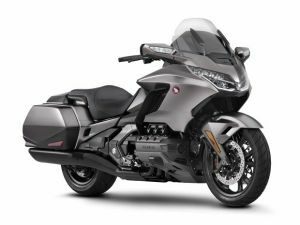 The new Gold Wing is a completely different proposition and replaces the relaxed lines of the outgoing model with a more honed, athletic ethos. Key words the Honda team used during development were ‘Refined Shape, Taut Styling’. It presents a unique silhouette and counterpoints comfort with the dynamic abilities of chassis and engine, adding the traditional Gold Wing premium level of fit, finish and materials. The new ‘face’ is daringly forward-slanting; combined with the compact fairing proportions, it presents an energetic frontal signature. The key line of the body, stretching front to back, highlights the differing upper and lower bodywork functions while clearly showcasing the reduced overall size of the machine. A central element is the fairing, with its sharp and solid flat surfaces, and its nuanced aerodynamic detailing. It adds a tension that hints at the performance on offer. It may be smaller and tauter in design, with a strong focus on the new aesthetics, but the development team responsible also had comfort, heat management and, most importantly, air management high on their agenda. The previous bike’s large fairing was designed to provide a pocket of still air behind it; the new approach is to channel airflow around the rider and pillion, effectively providing a pleasant cooling breeze. The reduced aerodynamic drag has also helped improve fuel efficiency. Gone too is the large windscreen; in its place a smaller electric screen, operated from the left handlebar. It provides excellent wind protection (with the rider and pillion closer to it than before) yet at the same time a sense of space and freedom when required. Screen angle and height adjustment is step-less. Available as options are a larger screen, a fully-adjustable deflector for the arms and upper body and fixed deflectors for the lower legs and feet. From a seating perspective rider and pillion are separated, much like the old model – the rider can enjoy riding the bike, while the pillion can sit back and enjoy the ride. The rider’s seat shape is comfortable and supportive while allowing movement – to enjoy the Gold Wing’s new dynamic – and easy ground reach. All lighting is LED. The lower portion of the headlights use 5 polished optical lenses on both sides to create a Jewel-Eye low beam light signature. Using high beam (in the upper portion) creates a stereoscopic impression. The front indicators are housed in the mirrors and the indicators also auto-cancel; the system compares front and rear wheel speed difference and calculates when to cancel the indication relative to the riding situation. The new Gold Wing’s cruise control too has evolved; the speed that’s been set with the cruise control switch (located on the right handlebar) is now shown in the bottom left area of the speedometer. Also, through TBW the system has achieved a smoother transition to the specified speed and a much smoother operation, especially when going uphill. In the case of the manual transmission models squeezing the clutch or brake, or twisting the throttle cancels cruise control. For the DCT variant (in AT mode) after completing the deceleration with the cruise control system in operation ­– and resuming the previous speed – the Gold Wing returns to the preset with an appropriate shifting schedule. Before designing the luggage Honda took out research to see just how owners were using their Gold Wings. And that intelligence led to the decision to reduce the total luggage volume as most were ridden for shorter, 2-3 day tours, with no need to carry larger amounts. The rear top box of the ‘Tour’ versions will hold 2 full-face helmets; combined with the panniers 110L storage capacity is available. Opening is via a button or smart key. Available as options are a luggage rack for the top box and exclusively designed inner bags. Capacity of the fuel tank is 4 litres less at 21 litres. But as the new Gold Wing is so much lighter and more aerodynamic, improved fuel economy of 5.6 litres/100km means tank range is similar to the previous design. Luxurious instrumentation creates a unique cockpit. Different low-contrast colours with dark tones are applied to the dials, of which the peripheral areas form cone-shaped slopes to create a feeling of depth. A ring with a metal texture surrounds each dial, and the graduations glow in LED, giving concrete depth and a calm, cool image. The 7-inch full-color TFT liquid crystal display screen provides infotainment-related information (for the audio and navigation systems) as well as managing the HSTC and suspension adjustment. Information is displayed in differentiated segments in a very functional order, so the rider can get all the relevant data with the minimum of eye movement. Brightness adjusts automatically (with the maximum luminous intensity of the screen being 1000 cd) and the rider can also choose from 8 brightness levels. Tyre pressure is displayed as a numerical figure in the bottom left area of the instruments. Pride of place – on the centre console and smart key – is the new Gold Wing emblem. Its crisp 3D, two-tone chrome design merges the strength and dignity of a lion’s head with the majestic wings of an eagle ready to pounce with open talons. It activates all the motorcycle’s systems and also incorporates the emergency key. The ignition and handlebar lock can be turned on or off while just carrying the smart key. Operation of the luggage is simplified. With the smart key present a push button opens the panniers and top box. It is also possible to temporarily unlock the luggage via remote control; the unlock button on the smart key enables the passenger to instantly access the saddlebags and the rear luggage box. Hydraulic dampers smooth the opening and closing. Pushing and holding the call button results in the indicators flashing. Just as the new Gold Wing is lighter and more compact, its high-output audio amplifier system too has evolved. Lightweight speakers are sited to work with the new riding position and achieve a sound quality with vivid presence. A passenger audio control switch is available to ensure an even more pleasant riding experience; the switches are located on the upper part of the right pannier and adjusting the volume, switching the source and fast forwarding is possible. The navigation system is displayed on the 7-inch full-color TFT liquid crystal display screen in the central area of the instruments and now includes a gyrocompass, which means guidance is continued even inside a tunnel. Cancellation of any waypoint or ‘go home’ instruction operation while riding is now possible. The new Gold Wing’s die-cast aluminium twin beam frame is designed to package the (now much more compact) engine in a tighter space, 40mm further forward. Its structural thickness has been optimised in each area to deliver a smooth and stable ride, from walking speed upwards, whether on tight city streets or out on the open road. The frame and swingarm together are 2kg lighter than the previous design. The riding position for rider and pillion is now 36mm forward, and thanks to the dynamic of the double wishbone front suspension (and the angles the double wishbones are set at) the back of the front tyre under full suspension compression is 24mm forward. Another benefit of the double wishbone front suspension is the reduction in sliding friction (from bump deflections and steering input) that a standard telescopic fork creates as the stanchions travel up and down in the fork leg; the new Gold Wing front end is 30% smoother. Bearings are used in all shaft bush areas for steering and suspension stroke, further reducing friction. The steering input – via the dual fork holders – is also separated from the suspension provided by the single shock absorber and the Gold Wing’s yaw is now 40% nimbler and easier to steer. In addition, a patented steering cross tie-rod connects the handlebars to the front axle and the position of the handlebar pivot with less mass around it (plus siting of the handlebars) delivers an entirely natural feel to the rider. The Dual Combined Brake System (D-CBS) optimally distributes braking force to the front and rear wheels. Whereas the ABS was operated by 2 motors on the previous model, both have been replaced by one smaller and lighter circulation type ABS modulator which has been integrated with the brake ECU, resulting in a 1.3kg weight saving for the braking system. It also operates in linkage with the current Riding Mode of choice, automatically adjusting the braking characteristics to the riding situation, enhancing security. Dual 320mm front discs are gripped by 6 piston calipers, the rear 316mm disc by a 3-piston caliper. A first for Honda is the Gold Wing’s new Pro-Arm; the old design used tapered bearings plus pivot point plates of the necessary thickness to provide correct rigidity. The new Pro-Arm design uses a redesigned (patent-pending) pivot shaft structure and attaches to the frame on its left side. The right side serves as a maintenance access. This has changed the stress and forces on the frame’s swingarm pivot plates, allowing much greater freedom of design and making the machine easier to manage; it also contributes to stability. Pro-Link provides progressive suspension action and comfort – the link plates have been optimised and spherical joints are used throughout, cancelling out torsion. Damping level is also adjusted electrically relative to the riding mode selected by the rider. Stepper motors housed within the front and rear shock absorbers move needles to control oil flow, tailoring damping force for the riding situation. Rear spring preload is also now electrically adjusted. It’s an intuitive – rather than numerical – system. Separate from the 4 riding modes, there are 4 settings of preload relative to load from soft to hard: single rider; rider with luggage; rider with pillion, and rider with pillion fully loaded with luggage. The setting is displayed on the TFT screen and adjusted via switch. Rake and trail are set at 30.5°/109mm, with wheelbase of 1695mm. The previous Gold Wing weighed 413kg wet; the new Gold Wing weighs 365kg wet. The Gold Wing Tour weighs 379kg wet and the DCT and airbox version weighs 383kg wet. Core to the previous Gold Wing’s appeal was its turbine-smooth flat six-cylinder engine, which produced torque from low rpm with a distinctive power delivery and feel that quickly became addictive. To realise the handling ambitions of the new chassis the 1,833cc engine too has been redrawn. Still as a horizontally-opposed flat six, but now with four valves per cylinder rather than two, much more compact in size and 6.2kg lighter. Peak power of 93kW arrives @ 5,500rpm, with peak torque of 170Nm delivered @ 4,500rpm. The bore size of 73mm (from 74mm) has been optimised to stroke of 73mm and bore pitch shortened 9mm; the left and right cylinders are offset 4mm and the cylinder sleeves are now aluminium. Compression ratio is set at 10.5:1. The Unicam cylinder heads – the inlet valves are operated by finger-follower rocker arm, the exhaust valves by roller rocker arms – also employ a co-axial rocker-arm shaft for both inlet and exhaust, doing away with the old model’s valve lifter structure. The combustion chambers are now a 4-valve ‘pentroof’ design (rather than a 2-valve ‘bathtub’) with the inlet ports designed to promote ‘tumble’ flows inside the cylinders thus improving efficiency. The piston skirts wear a molybdenum coating to reduce friction. A stiffer crankshaft, constructed from SCM440H steel, allows a pin offset of -4mm and compared to the previous design the new engine is 33.5mm shorter in length. The crank sensor (which detects engine speed and piston position for EFI and ignition) has been moved from the front of the engine to the rear, reducing the distance between the front cover and crankshaft by 7mm. The addition of Throttle By Wire (TBW) has brought with it 4 rider modes to alter the engine’s character and power delivery, linked to Honda Selectable Torque Control (HSTC), suspension damping and the Dual Combined Brake System (D-CBS). TOUR mode is the base setting for comfort and power. It gives a direct 100% opening ratio between throttle grip and throttle body butterfly, with ‘default’ damping and front/rear brake force distribution. SPORT serves up the highest throttle to butterfly ratio and delivers strong acceleration, with firmer damping and rear brake lever pressure. ECON mode offers maximum fuel economy and easy cruising, with lower throttle to butterfly ratio and default damping and brake force. RAIN turns the dial down to suit wet and slippery conditions, with lowest throttle to butterfly ratio, default braking force distribution and soft suspension damping. In all 4 riding modes HSTC constantly allows controllable acceleration in slippery conditions. A single throttle body has replaced the dual throttle bodies of the previous design, with revisions to the diameter and thickness of the intake manifold to save weight. Intake manifold volume, from the throttle valve to intake valve has been reduced by approximately 10%, speeding up airflow and improving response. There are two air intake ducts sited front left and right rear. This structure generates swirling as the air is drawn in – the result is more effective use of the air filter’s entire surface area and reduction in resistance. The internal shaping of both ducts has been optimised to align with the intake pulses of the engine’s low-rpm range, improving response and torque from smaller throttle openings. The sound and feel of the Gold Wing’s engine has always been its calling card. While the new dual exhausts maintain the internal structure of the old model – 2 internal chambers plus a resonance chamber – the glass wool has been removed to save weight. To complement the engine’s deep bass signature the exhausts now emit a powerful throb, without excessive noise. The cross-sectional areas of the exhaust pipes have been reduced 20% for two out of the six cylinders, bringing about the change in sound volume and depth. The ISG (Integrated Starter Generator) combines the generator and starter motor into one component, with the generator effectively becoming the starter motor when supplied with reverse power. The damper used for the coupling joint that transmits the driving force from both the ISG side and the crankshaft side has been changed from the viscous type used for the generator of the previous model to the mechanical, using an arc spring and rubber; weight is reduced by approximately 2.4 kg for the system as a whole. Helical gears are employed for the ISG driving gears, reducing the mechanical noise of the engine. Key characteristics of the Idling Stop system are the ultra-quiet start-up of the engine thanks to the use of ISG, and the smooth starting feeling achieved through a combination of DCT and TBW control. When stopping at a traffic light with the Idling Stop system on, the engine automatically stops after 3 seconds and, when restarting, the rider only needs to turn the throttle, which immediately starts the engine. The system is controlled so that hydraulic oil pressure is applied in advance to the DCT line that activates the clutch when the engine starts, so the time lag from when the rider opens the throttle to movement is reduced. To curb any abruptness the TBW makes the throttle butterfly open gradually following the throttle opening – thus the smooth acceleration befitting of a Gold Wing. Idling Stop can be turned ON or OFF from the right handlebar switch. Hill starts on a conventional motorcycle often involve simultaneously releasing the brakes, opening the throttle and engaging the clutch according to the grade of the slope. To ease this effort, the new manual transmission Gold Wing has adopted Hill Start Assist (HSA). After stopping on a slope, further squeezing the brake lever quickly results in the ABS modulator generating hydraulic pressure for the rear brake caliper. When setting off – even when the brake lever is released – the hydraulic pressure temporarily retains braking force (for about 3 seconds) so starting on the uphill slope with the throttle is possible. When in operation, the HSA indicator is switched on to inform the rider. The new 6-speed manual gearbox lowers the engine speed when cruising at 100km/h, compared to the previous 5-speed design. It’s also fitted with a ‘cam damper’ between the clutch and transmission, separating each inertial mass, reducing noise and improving shift quality/durability. A cam assist and slipper clutch (with fewer discs and reduced hydraulic friction in the release mechanism) has replaced the hydraulic assist clutch. This has reduced clutch load at the lever by 20% and also smoothed downshifts; the slipper mechanism also contributes to the high-quality downshift feel. The reverse mechanism is exactly as it was on the previous Gold Wing. Honda’s unique Dual Clutch Transmission is a natural fit for the new Gold Wing engine and development revolved around DCT as the base. This is the third all-new generation of the system and the first to have 7-speeds, specifically designed for long-distance cruising; it’s also extremely smooth and fast shifting. And lighter than the 5-speed manual transmission fitted to the previous design. DCT delivers consistent, seamless gear changes up or down and very quickly becomes second nature in use. It uses two clutches: one for start-up and 1st, 3rd , 5th and 7th gears: the other for 2nd, 4th and 6th, with the mainshaft for each clutch located inside the other for compact packaging. The result is a consistent, fast and seamless gear change. Furthermore, as the twin clutches transfer drive from one gear to the next with minimal interruption of the drive to the rear wheel, any gear change shock and pitching of the machine is minimised, making the change feel direct as well as smooth. Extra benefits include durability (as the gears cannot be damaged by missing a gear) impossibility of stalling, low stress urban riding and reduced rider fatigue. In the lower speed range of the new Gold Wing’s DCT system, the ratios are close, reducing shift-shock and in the higher speed range set wider apart to reduce engine rpm. In both speed ranges comfort is improved as shifting up or down is of the highest quality. Shift noise and shock have been addressed throughout the development of the third generation of DCT. Noise damper rubbers on both ends of the fork guide and the master arm greatly reduce any impact sound during gear changes. A spring damper has been installed between the clutch and the main shaft in order to absorb the torque in the rotational direction, thus reducing the noise and shock of the contact between the clutch and main shaft when shifting gears. The new Gold Wing’s DCT features a 1.8km/h forward Walking Mode with reverse of 1.2km/h, operated instantly from a +/- switch on the left handlebar. Of the main shafts with a double tube structure, the outer main shaft connected with the even-number gears is linked to the inner shaft with a chain, by way of the gears on the counter shaft. This structure gives outer main shaft the role of the reverse idle shaft, which has resulted in a lightweight reverse mechanism with a compact structure - with no need for any reverse idle shaft. When activating Walking Mode the two clutches of DCT are utilised to enable moving backward with clutch #1 and moving forward with clutch #2. In this way, moving forward or backward at walking speed is now possible with only clutch control, without any need for gear shifting. Furthermore, the throttle-by-wire system controls speed by minutely controlling the clutch capacity, while maintaining a certain engine speed, assuring controllability with a sense of security in wide-ranging situations. The 4 riding modes are interleaved with DCT. All share the same engine character, delivery and suspension settings as the MT model but add extra DCT-specific parameters. TOUR uses the default setting for smooth clutch engagement and gearshifts in AT mode, with a low-to-high rpm range for gear shifts. SPORT deploys a more direct clutch engagement, with gear shifts programmed in a mid-to-high rev range. ECON has a soft clutch engagement, with low-to-mid rpm gear hold and default shifting feel. RAIN also operates a soft clutch, low-to-high rpm gear hold range and slower shifting in AT mode.